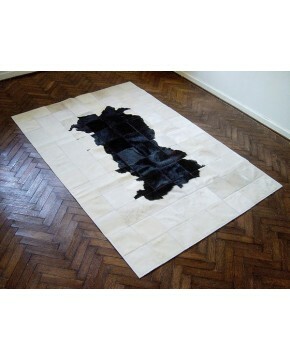 A strong design statement, this black and white/ivory patchwork cowhide has a contemporary feel. 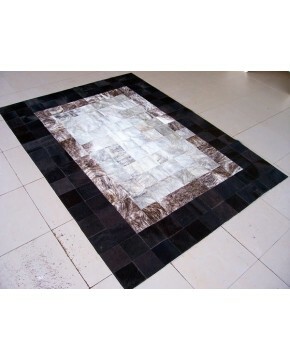 39" x 63" (100 x 160cm) approx.47" x 63" (120 x 160cm ) approx.47" x 71" (120 x 180cm) approx.63" x 94" (160 x 240cm) approx.71" x 94" (180 x 240cm) approx.79" x 118" (200 x 300cm) approx.94" x 142" (240 x 360cm) approx. 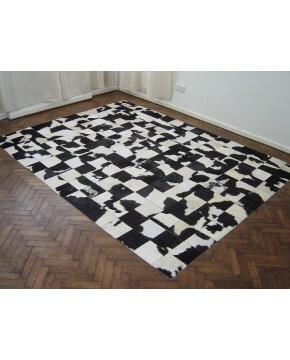 This black and white/ivory patchwork cowhide rug creates a very contemporary look, but either colour could be substituted for another, perhaps brown instead of the black, or grey instead of the white/ivory? 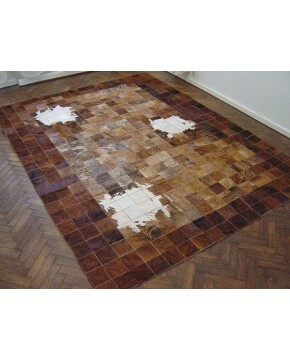 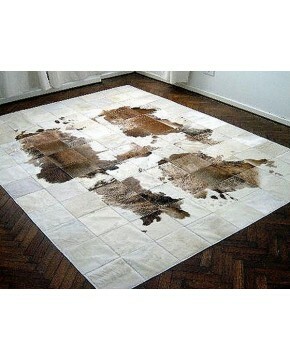 Smaller squares of cow hide can also be used. 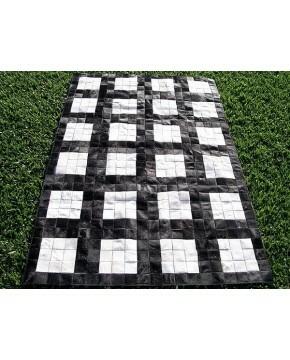 Please note that different sized patches to the ones suggested can be used. 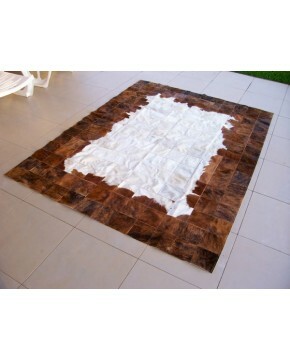 We are able to make patchwork cowhides in virtually any size you may want, and the design shown can be adapted to your tastes also perhaps changing the white to brown or the black to white, etc. 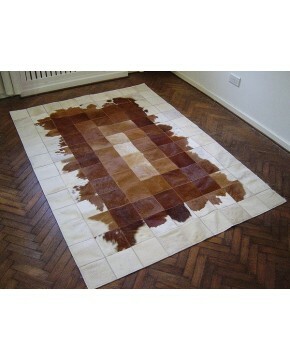 They can also have a thin leather border if required, or leather patches to replace some of the cowhide ones shown in this rug. 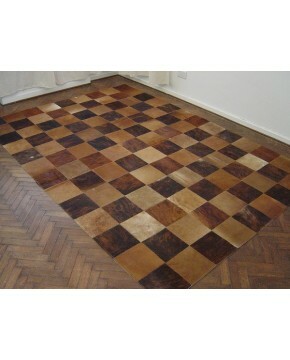 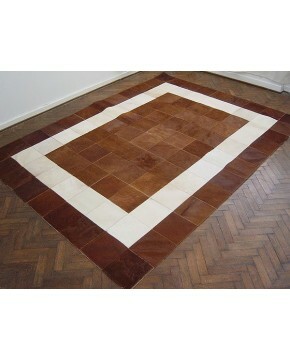 Just call or email us for a quotation or to discuss your ideas further. 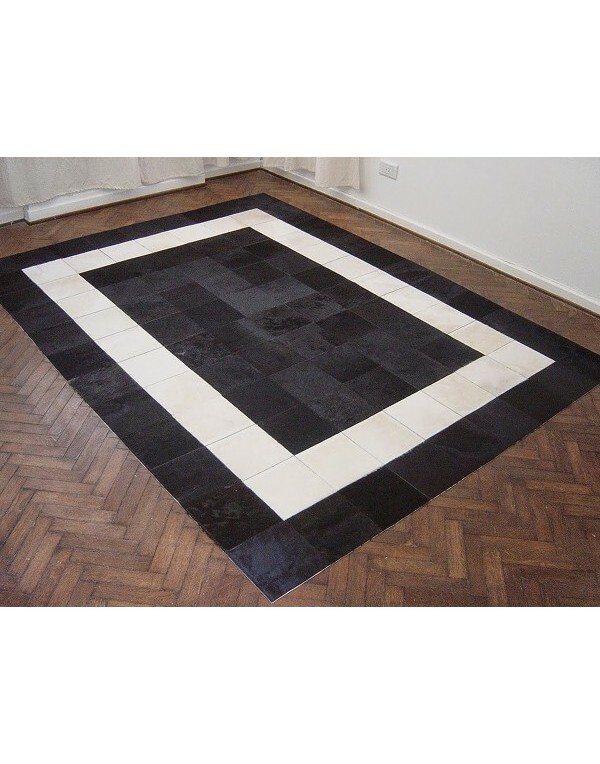 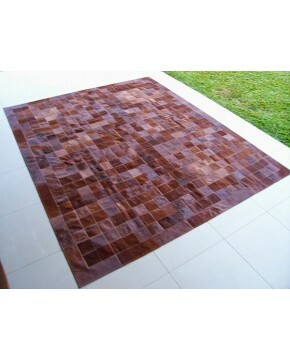 If your rug is to be used on top of a hard, tiled, wooden floor, then we suggest selecting the non-slip backing. But even if the rug is to be positioned on top of an existing carpet or rug, the non-slip backing gives additional weight to the patchwork, making it a more substantial, and better quality item, in our opinion. 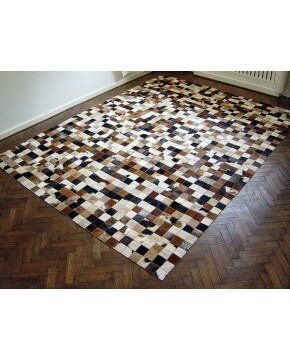 Please remember that these are handmade rugs and the overall measurements may vary slightly from those stated. 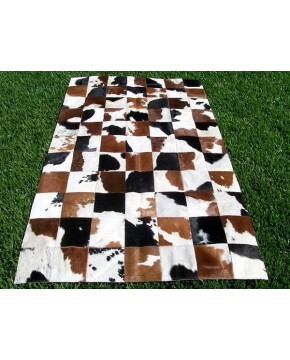 Also, they are produced from a natural product, and each cowhide used is unique; shade and pattern in the hide can vary slightly between rugs. 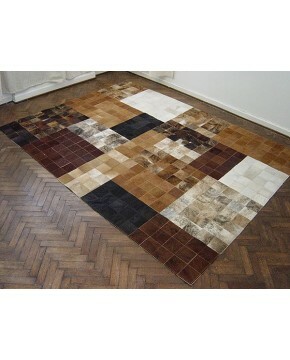 Usual size of squares/panels used - 20cm x 20cm (8" x 8") approx. 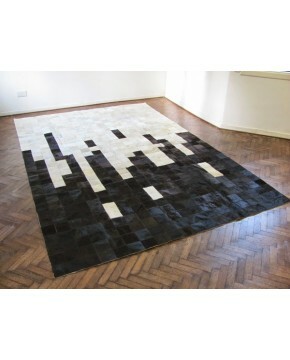 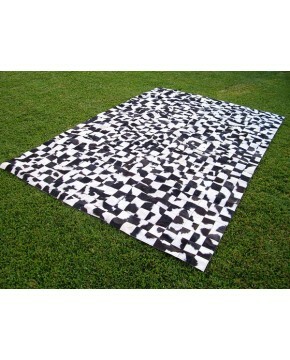 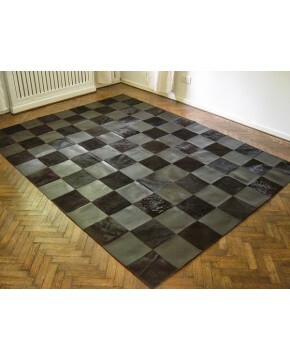 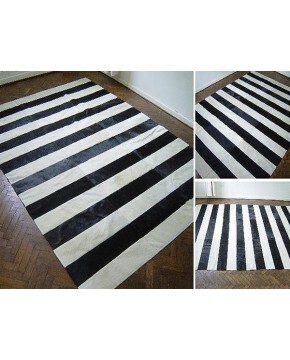 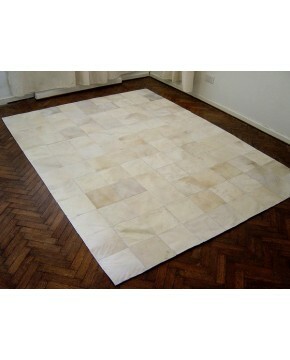 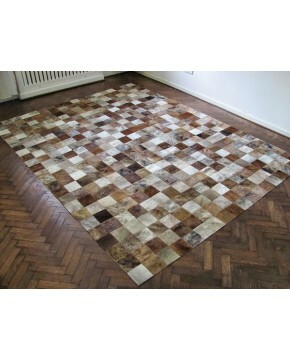 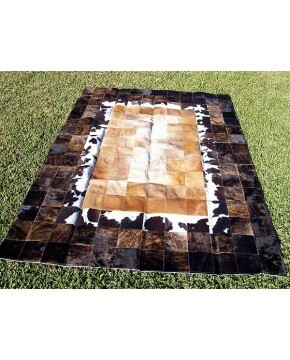 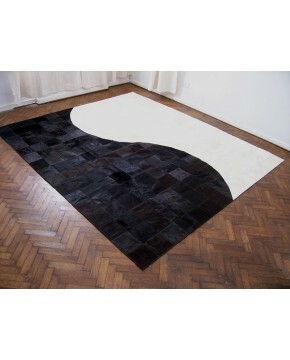 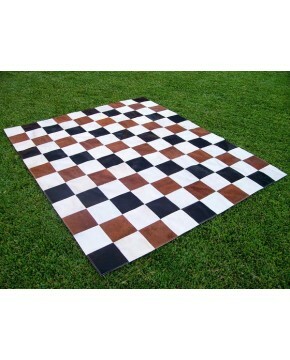 Description: A strong design statement, this black and white/ivory patchwork cowhide has a contemporary feel.